Shimizu ku has of recent years at the forehead of fruit development. 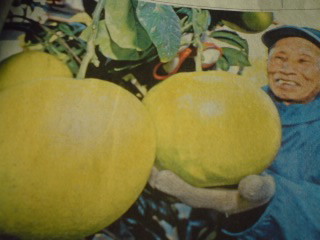 The latest is the largest citrus variety know in the world, which comes under the Japanes name of “晩白柚”/Banpeiyu. Originally from Malay Peninsula, it has successfully grown in Shimizu Ku. It can reach a circumference of 65 cm and weigh as much as 3 kilogrammes! Even so this year’s crop was comparetively small in size and volume. I wonder what would represent a good crop! Could be. It does go by many names!